Mold spores occur in every home and are impossible to eliminate from inside your home. Mold spores are brought inside a home through our windows, doors, heating, ventilation and air conditioning systems. They also enter indoor spaces by attaching to our clothing, pets, shoes, bags and even our building materials! The key to preventing mold growth is by controlling moisture levels in your home; an ideal humidity level is between 30 to 40%. Not all mold is bad; in fact, mold has an important purpose in our eco-system to consume dead organic material. With that being said, it can also pose as health hazards when it begins growing in indoor environments. People react differently to mold based on the length of exposure, type of mold, respiratory system, their immunity and allergies. Children, pregnant women and elders are more prone to develop health symptoms. Homes can be a perfect environment for mold to growth being that they have ample food sources for mold – building materials and water. 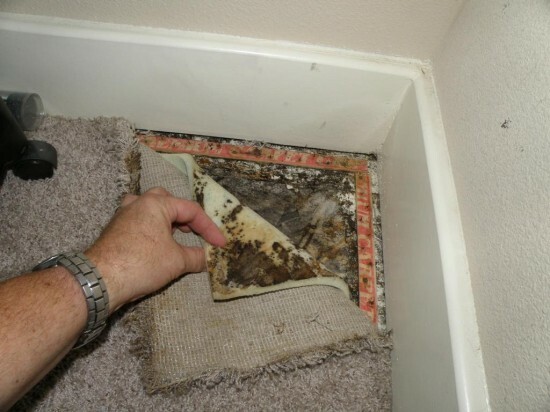 Molds feeds on organic material, within a home tends to grow in areas of: wood & wood products, paper & paper-like products, fabric, drywall, leather, fabric, cement, carpet, and grout. There is always a risk of some of the mold spores that are present in your home taking sprout and growing, given that they have their key ingredient for growth – moisture! The commonly known sources of moisture include floods; backed-up sewers; leaky roofs and/or water leaks. Though there are also less familiarly know culprits, such as a humidifier (requires regular cleanings); damp basements or crawl spaces; house plants; steam from cooking and showers; wet clothes hung to dry indoors; inadequate air exchange; excessive humidity; and condensation (which is especially a problem during the winter, on poorly insulated surfaces). In the presence of moisture, the ideal temperature and ample food, mold will begin growing within 24 to 48 hours. Most people think their home does not have mold because they can not see it. This is a problem as most mold is hidden; it can often be discovered behind a leaky shower or tub, behind walls or attics to name a few. Mold can be detected through smell, visual clues, and knowledge of the building history, and often requires trained professionals with the proper tools, experience and knowledge. The first step a mold inspector / indoor air quality specialist will conduct is an assessment to determine if mold may be an issue in a home. The professional will use information regarding building history, health of occupants, moisture readings, and conduct a visual inspection with the assistance of a thermal imaging to investigate for moisture problems and visible apparent mold. The inspector may also collect mold samples, either with a swab test, tape sample or air quality test for lab analysis to determine the type of mold and spore count present. The goal of these tests is to determine the extent of the mold problem to allow for recommendations to address the mold issue. If the tests indicate that there mold is present, then the first step is to fix the source of the moisture problem before removing the mold and having the air cleaned with an ozone blasting treatment. Mold is a serious issue. If left untreated, it continues to grow and deteriorate the building materials and impact the air quality in your home. Mold is a living organism, as long as it has the ideal living conditions and food sources, it will continue to strive. Failure to fix the underlying causes of mold and effectively removing the mold will lead to further structural damage and reduced property value. Take the first step to protecting your greatest investment by taking our short online Air Quality Assessment to see whether there may be a mold or air quality problem in your home. Questions about mold? Call us (403) 585-6279 or email us. We look forward to helping you ensure your home is healthy and safe!